Primera linea playa en exclusiva urbanización. Gran terraza con vistas al mar. Apartamento acogedor, moderno y funcional. Totalmente equipado con capacidad para cuatro personas. Dispone de suelos de mármol en todo el apartamento, wifi, fibra óptica, aire acondicionado frío/calor, televisor HD 55 pulgadas, televisión por satélite y canales internacionales. Cocina independiente completamente equipada con electrodomésticos Bosch (nevera, microondas, horno, lavadora y lavavajillas), vajilla, utensilios de cocina, cafetera nespresso y tostadora. Dos dormitorios dobles con baño en suite, uno de los baños con bañera y el otro con ducha, ambos baños con suelo radiante. El dormitorio principal con salida directa a la terraza. 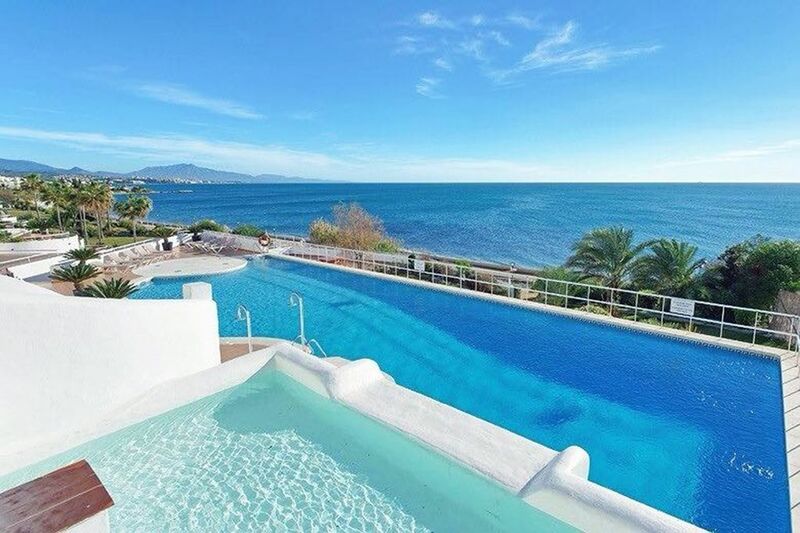 Amplia terraza con vistas al mar, Estepona y Gibraltar. La vivienda dispone de persianas de seguridad y alarma. La urbanización cuenta con jardines y acceso directo a la playa, gran piscina con cascada y tumbonas. Vistas panorámicas al mar Mediterráneo, Estepona, Gibraltar y con espectaculares amaneceres. En plena Costa del Sol. Exclusiva urbanización muy tranquila, con piscina, tumbonas, jardines y acceso directo a la playa. A 80 km se encuentra la estación de tren de alta velocidad Málaga Maria Zambrano (desde donde pueden desplazarse para visitar Córdoba o Sevilla de forma cómoda y muy, muy rápida). Lugar para relajarse en las vacaciones, perfectamente ubicado para tal fin, apartamento en perfecto estado, exactamente igual a las fotos que facilitan, anfitriona muy simpática, siempre atenta a cualquier inconveniente que pueda surgir. Las vistas desde la magnífica terraza son impresionantes y relajadoras. Recomendable al 100%. Beautiful apartment in a beautiful coastal town! This is a beautiful apartment in a quiet and well kept community. The apartment is very nicely maintained and has quality indoor and outdoor furniture. The terrace is large and has spectacular views of the coast. We enjoyed the tranquility of the community and it was only a short drive to the restaurants, bars and shops in Estepona, Marbella and Sotogrande. We will definitely be back to visit Again! Thank you for the message, we always try that our guest enjoy the stay and vacation. It has been a pleasure to meet you, I would love to see you again next year. We had another glorious week at this remarkable property. Our host made sure we were taken care of in spite of a terrible rain that took our power and internet away for a bit. All was in fine condition and our every comfort was met. One small piece of advice to anyone visiting at this time of the year may be to include some mosquito spray in your luggage. We had pesky visitors in the overnight hours even with our screens closed. Otherwise, recommend without hesitation if you are ready for a quiet, relaxing week with astonishing sights and sounds of the sea at your fingertips! Enjoy! Thank you very much for your kind comment, it has been a pleasure to see all of you again and of course try to solve the inconveniences that arose on the rainy day. I am glad to hear that you enjoyed your stay in spite of the mosquitos (normally the mosquito net works, I will check it all the net around). Thank you so so much, I would love to welcome you again next year. Really nice apartment well maintained as is whole complex. Marisa very helpful. Great stay only down side is you need a car to go anywhere as no restaurants or bars in walking distance. Would definitely go again. Thank you very much for your nice comment, Margaret. I agree, it is necessary the car to go to bars and restaurants but in my opinion (I live here permanently) it has the advantage that when you return to the apartment you have all the tranquility and peaceful, away from the noise and bustle of the leisure areas. It has been a pleasure. You will always be welcome again. Lovely apartment with all mod cons smart tv and fast internet great for teenagers! Beautiful sea views with very large terrace. The shared pool was large and never crowded even though we where there during school holidays. Beach on your door step hardly any people on them. Beaches with restaurants and facilities a short drive. Couple of restaurants with in walking distance including a nice beach bar. Would recommend if you don’t want to be in the really touristy part of costa del sol. Owner Marisa was helpful and kindly let us check in early many thanks to her. Thank you very much for your comment, it has been a pleasure to meet you and have you and your family in the apartment. Whenever it's possible I do the check in before 16.00 so that the guests start earlier to enjoy the holidays. I hope to see you again. La entrada será a partir de las 16.00 horas y la salida antes de las 10.00 horas. The entry to the apartment will be after 16.00 hours and the departure before 10.00 hours.